The Wireless Society of Southern Maine began as a group of friends with a common interest in ham radio, who met weekly at the Wassamki Springs Campground in Scarborough. In early summer of 2010, these friends decided to create a more formal organization, recognizing a need in the community for a club that was welcoming, helpful, and receptive to new ideas. 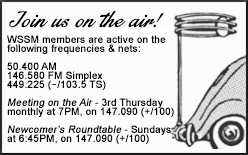 Please join us the 3rd Thursday of each month, from 7pm-9pm for a Meeting on the Air on the 147.090 (+ / 100) repeater. All are welcome, including non-members. The net welcomes traffic to be forwarded via Radio Relay International. Immediately following will be the After Net on 28.455 kHz SSB. WSSM brings together both new and experienced operators alike to share in the enjoyment of amateur radio, and encourages improvement in all the various phases of the hobby, including public service potential, operating ability, courtesy, and technical proficiency. 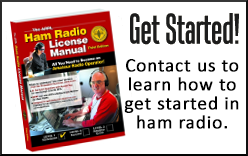 Membership is open to all persons interested in radio communications. There is NO requirement to be licensed, however only licensed operators and full time residents of the area can be Full or "voting members." At our monthly meetings, we like to encourage participation in round table discussions covering a wide range of ham radio topics. 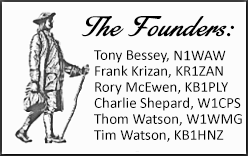 We cordially invite you to visit us and to become a member. During the fall and winter, (from September-May), formal meetings are held on the second Thursday of each month from 7PM-9PM, at the Cumberland County EMA Bunker, located at 22 High Street, in Windham, ME. Click here for directions. Informal meetings are held at "The Point" located at 345 Clarks Pond Parkway, in South Portland, ME. During the summer, (from June-August), meetings are held at Wassamki Springs Campground, located at 56 Saco Street, in Scarborough, ME. Click here for directions. See the Calendar of Events for the latest meeting information. 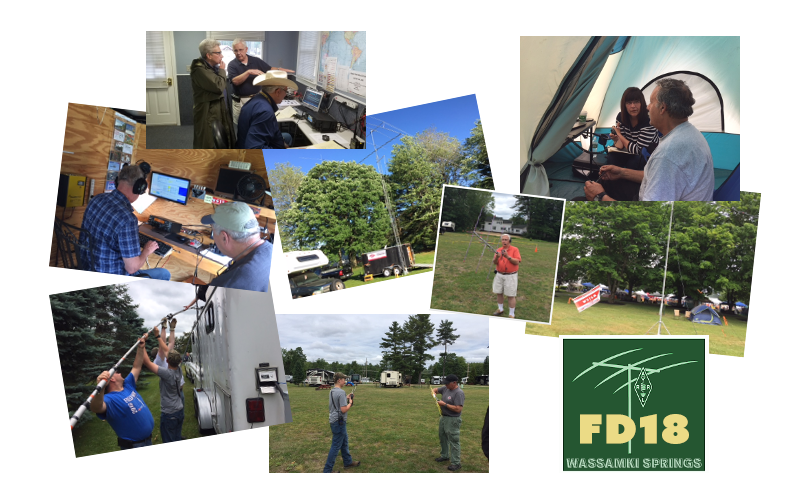 SCARBOROUGH, ME - On the weekend of June 23-24, the WS1SM team participated in their 8th ARRL Field Day from Wassamki Springs Campground, in Scarborough. With over 30 participants and guests, including visitors from Cumberland County EMA, public service representatives, and Scarborough Town Councilor, Jean -Marie Caterina, the activities were many. On the air, we operated as 3A (which is a club station, on battery power, using 3 transmitters), maintaining a continuous presence on the bands on CW, SSB, and digital. We also had a Get on the Air (GOTA) station operating during most of the event, allowing beginners and new hams to operate HF. Click here to view photos of the event. Over the past several years, WSSM members have activated numerous summits across New England, including Bradbury Mountain (ME), Mt. Agamenticus (ME), Mt. Washington (NH), Mt. Battie (ME), Mt. Megunticook (ME), Douglas Mountain (ME), Cadillac Mountain (ME), and others. Most recently, on May 27th, K1GJY and KB1HNZ ventured to the 3850 ft. summit of Mt. Equinox (VT), W1/GM-003, to activate it for Summits on the Air. Look for WS1SM spotted on the SOTA Watch website, or monitor 146.520 simplex during the weekends to find us on the air from our next hilltop expedition. 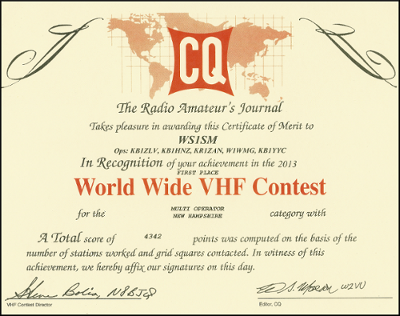 Above (on the left), is a certificate for 1st Place in the CQWW VHF Contest. WS1SM earned first place in the Multi-op category for New Hampshire 4 years in a row! 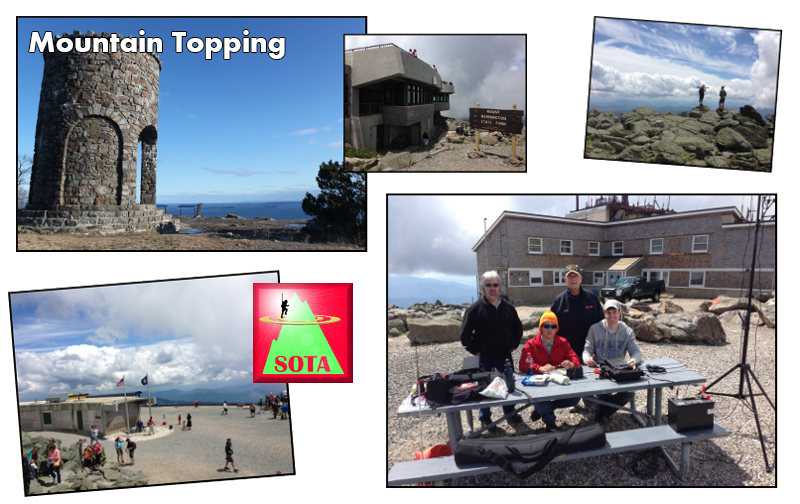 On the right is a QSL card from one of our SOTA/Contesting adventures to the summit of Mt. Washington, in New Hampshire. International Lighthouse & Lightship Weekend is an annual radio activity that started 17 years ago in Scotland by members of the Ayr Amateur Radio Group. 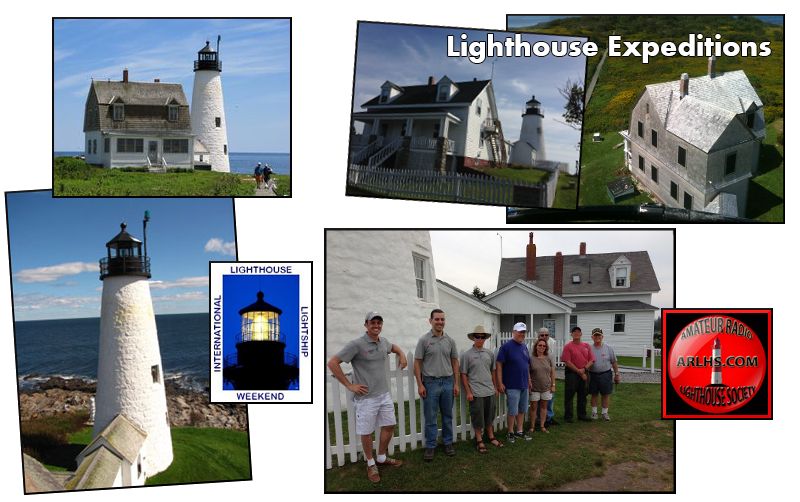 ILLW evolved from the Scottish Northern Lighthouses Award Weekend into a popular international event, which now sees over 450 lighthouses and lightships participating from over 85 different countries. 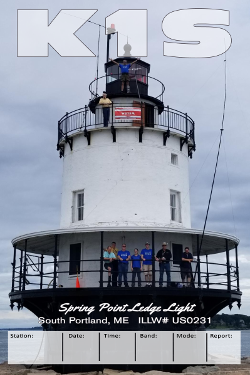 Spring Point Ledge Light had the designator US0231 during the event. 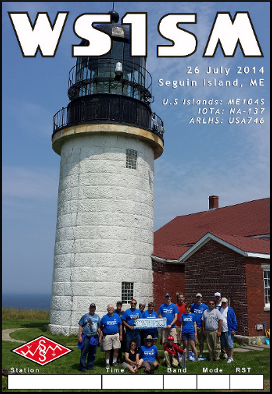 SEGUIN ISLAND, ME - On July 26, an international team of hams set off to Seguin Island to activate it for the 2014 RSGB Islands on the Air Contest. Team members packed their gear aboard the Leeward which departed from Fort Popham early Saturday morning. Once at the island, our planned operating position, which was Seguin Island Head Light, vanished from view, since it was situated atop a large hill on the far end of the island. Gear was packed aboard an inflatable dinghy and a few people at a time were rowed to shore by one of the ship's crew. Once everyone and everything was unloaded on the small beach, the heavier equipment was piled onto a tram that was pulled to the top by a chain-driven diesel engine. We hiked along a trail on the side of the tram line, and made it to the lighthouse about 15-20 minutes later. Once there, we began to setup our 4 stations (3 HF, & 1 VHF). We used a variety of wire antennas, a BuddiPole, and mast and beam for VHF. We made many contacts with participating stations, including several other island expeditions around the world. 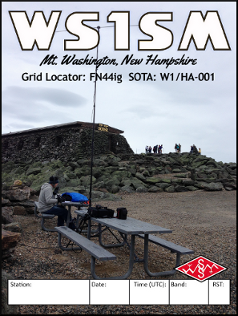 WS1SM is the official club station of the Wireless Society of Southern Maine. The call sign is activated during contests, special events, and expeditions. Use this handy tool to see if you're in our log.